In need of a fun and easy project to do with your kids for Mother’s Day? Try this painted clay pot planter that’s a snap to make two different ways. Surprise mom with one or both and give her keepsake that lasts. Mother’s Day is just around the corner! The most precious gifts I receive are those made by my children. I’m especially fond of those featuring their hands, feet, etc. because they capture their size in the moment, and it’s so much fun to compare them from year to year! They grow so fast, and are only little for such a short period of time, that I treasure each and every thing they make. P.S. I have a feeling that grandmother’s might be partial to these gift ideas too. For option number one, start by letting your child paint the clay pot with the acrylic paint. This can be done with fingers, brushes, or sponges depending upon your little Picaso’s age and ability. Once painted, let your clay pot dry completely. Use your child’s hand to trace the handprints. If your child is old enough to use safety scissors on their own, they can cut out their handprints (supervised, of course! ), or you can cut them out for them. Staple the hand prints to the straws. Once your pot is completely dry, fill the inside with whatever filler you’ve chosen (we used beans). *Note: Be sure to keep small items that could be a choking hazard away from small children! Arrange your hand print flowers into the filler by cutting the straws to varying lengths. Sit back and enjoy your work of art! Ready to see how you can make this another way?! Small flower – We used real flowers, from the garden center, but artificial flowers would work too! For option number two, paint your small clay pot with the acrylic paint and let dry completely. Once the pot is dry, fill with potting soil and small flower. Don’t forget to water your plant! *This post contains affiliate links, be sure to refer to our disclosure policy for more information. It looks like a fun craft children would enjoy. My grandson would love to make this for his mom. Pretty cool crafting project for Mother’s Day. what a fantastic craft and a beautiful gift for anyone! thank you! My grandson loves to paint. It would make a cute gift for his mother. This looks like a really fun craft to make with the cousins when they come over! I wonder what we would plant? Now I know what to do with all my old pots. What a great project with my younger grandchildren actually the older ones too. This will really dress up my clay pots real well. I appreciate the great decorating idea. This is so cute. It’s something my daughter and I would have done when she was younger! What a great little project! Thanks for sharing! My great grandkids would love to make something like this for their Mothers on Mother’s Day!! Homemade gifts mean a little more to me, because they were made from the heart and I love to keep them. They could also teach their children when they have them. They can make these gifts an awesome tradition! I pinned this! This looks so cute & so fun to make. These are unique and special planters. They would make a wonderful gift for Mother’s Day or even a birthday. This would be a great project! That’s a fun craft. Just right for Mother’s day. What a fun craft to do with my Grandkids!! Such a great idea + gift!! That is such a great idea. So cute! Thanks for the idea!! I really do appreciate it since Easter’s idea died a fine death… in a pile of markers and paints when one child noticed the marker wasn’t washing off his hands and got very upset. My hands we stained for days! 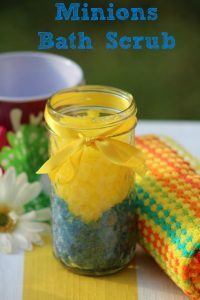 My kids from 10 to 2 could enjoy this craft together and not make a huge mess as well! This is such a neat craft to do with the little ones! A great project for a rainy day. OMG! This is super cute and what a great keepsake! My daughter would love to make one of these for her dad. Thanks for sharing! This looks like a great project. My niece would love this one. These look like a lot of fun to make. Lovely craft ideas. Plants are very good. This would be really cute for Father’s Day. Homemade presents are the best! This is such a sweet little gift! My 4 year old would love making these for family members! This is such a great idea. I think it would be nice for grandma!! Love it!! This is so cute!! The little ones would enjoy making and giving this to their mothers and grandmothers. This is cute! Would be great for Father’s Day. Thank you!